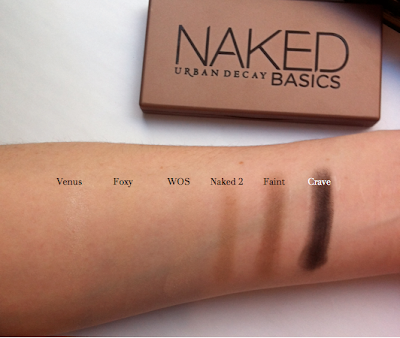 I finally jumped on the band wagon and purchased Urban Decay's Naked Basics palette. I use matte eyeshadows everyday but usually only for blending in the crease or for setting eyeliner, so I was debating purchasing this palette. However, it's compact size and perfect shades for a complete eye look won me over in the end. And now I just might be a matte shadow convert. The packaging is roughly half the size of Naked 1 and 2 and is again another type of packaging. 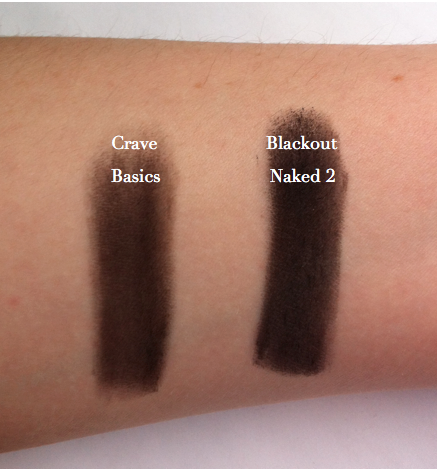 Naked 1 was velvet & paper, Naked 2- aluminum, Naked Basics is more of a rubberized finish. I love the size, great for traveling in a make-up bag. I do find it difficult to open (but that just might be me). There are 4 new shades (Venus, Naked 2, Faint, Crave), one from Naked 2 (Foxy), and one that was released with the Build-Your-Own palettes (W.O.S.-Walk of Shame). 5 of the shades are matte while 1 (Venus) has a shimmer/satin finish. The shades are typical UD quality, pigmented & creamy. It was difficult to photograph the lighter colours since they closely match my skin tone. I have been loving using this palette, and I have used it everyday since I bought it. But....with the other Naked palettes do you really need this one too? To hopefully help answer this questions, I decided to swatch comparisons of colours in the Basics palette with colours in the previous Naked palettes. Here are the highlight shades of the palettes. Difficult to capture but Venus is more neutral, Virgin has a pink-undertone, and Bootycall is more golden. So no dupes but each fulfills the highlighting role. 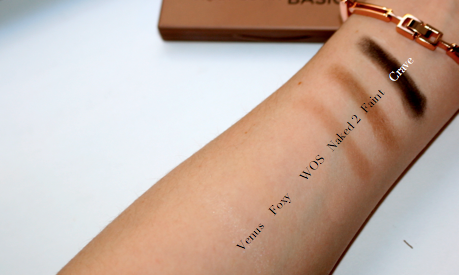 Naked 2 is included in the Basics palette while the first Naked was in Naked 1. Again, not duplicates, but similar. 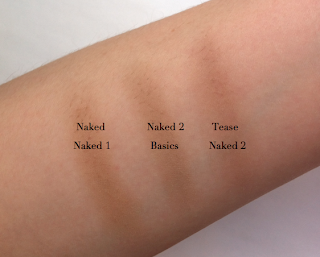 Tease from Naked 2 is also similar but more taupe with a slight mauve tone. Buck and Faint are both medium browns; however, Buck is much warmer while Faint is neutral, slightly cooler leaning. Blackout is the blackest black imaginable. Crave is, though appearing black, a very dark black-brown. 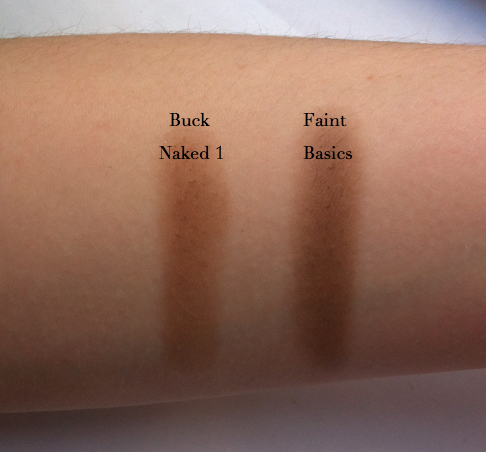 So if you have the previous Naked palettes and aren't much of a matte user you may want to pass on the Basics palette. If you are a matte eyeshadow lover than this is a great palette, or if you are a frequent traveler Basics is great for it's size and versatility. You can purchase this palette at Urban Decay's website or at Sephora for $27. What's your favourite UD Naked palette? Wish the Naked palette's were easier to get in Australia :( this one looks divine!